Headquartered in Los Angeles, PhoneSheet is a company dedicated to simplifying the lives of individuals for whom phone call management is an important workday function. 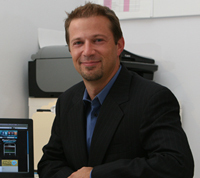 PhoneSheet was founded by entertainment industry veteran, Jan Zands, who for more than a decade designed software applications to improve the business functions of industry companies such as Universal Pictures, Paramount Pictures, FOX Television Studios, and Michael Ovitz’s Artist Management Group. In his time working for these firms, Jan could never figure out why no office seemed to have a simple, but effective means by which to manage the barrage of important phone calls; messages were often lost, unreturned, or hopelessly buried in a mound of sticky notepads and random bits of paper. While these companies were spending small fortunes on complicated information systems, the very lifeblood of their industry, the phone call, was being completed disregarded. This was the origin of PhoneSheet. 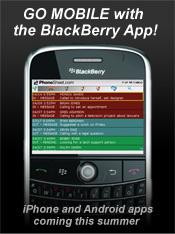 Jan and his team of handpicked developers spent several years producing this easy-to-use, phone message manager. Through a secure Web 2.0-based portal, users can track phone calls, messages and call history in real-time either at their desk or when working remotely through their cell phones. 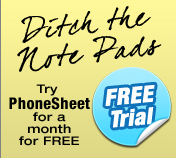 PhoneSheet makes the management of daily ’phone work’ a less tedious, more efficient and highly organized process. And while Jan’s intentions were to fix the chaos of phone management in the entertainment industry, it has become clear that this need exists for so many other business owners, independent practitioners and any administration professionals charged with managing phone messages. 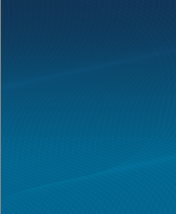 We invite everyone to try PhoneSheet. If you have any questions, please contact us at support@phonesheet.com. Current subscribers may post questions to Jan or his technical team directly through our Online Community.